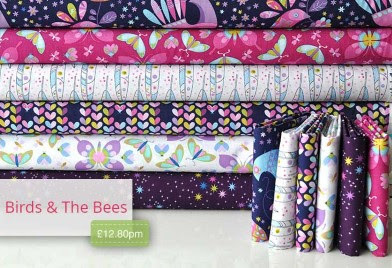 Just sneaking in my monthly visit and Eternal Maker have had some big ranges delivered as well as starting their new pattern range, 'Two Stitches', the first is for babies! Let's have a look! 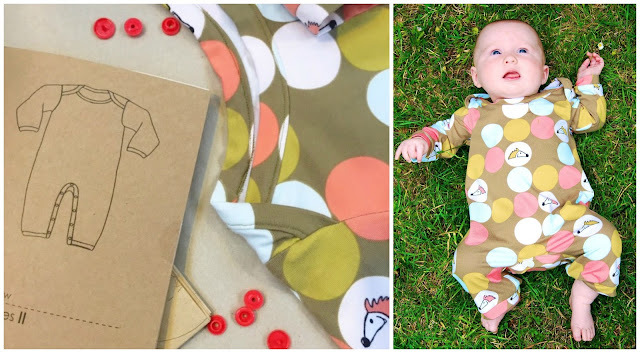 This is the Grow Babygrow pattern, a classic onesie design graded from newborn to 24 months. 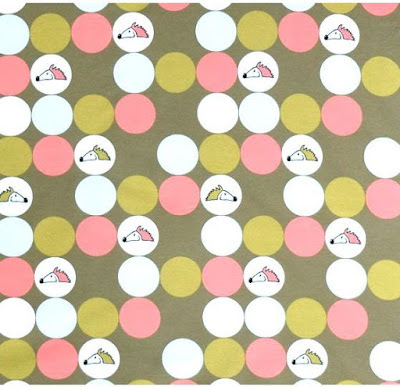 Its designed for jersey fabrics and can be sewn on a standard sewing machine with zig-zag stitch or on an overlocker. The pattern pieces are nested which makes tracing off a lot easier - this is a pattern to reuse in different sizes and it's aimed at the advanced beginner. 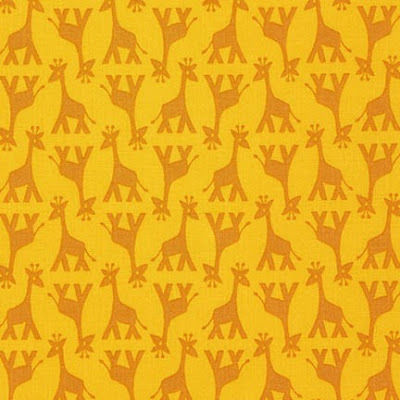 The Lillestofff high quality organic knit fabrics are a great choice for this pattern. They have 5% elastane and are a wide wish at 150cm. 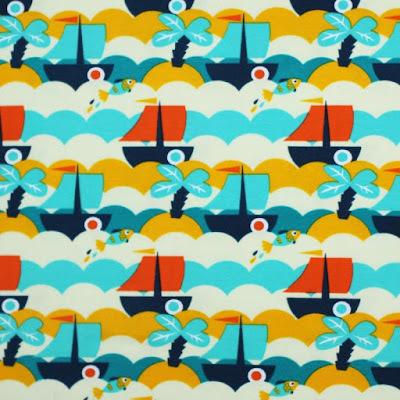 You can find all five Lillestoff designs here - there are whales and camper van designs too. You can also find clear sew-in popper snaps here. Congrats on the new design! A great basic and would make a lovely gift too. Necklace in Grey: I imagine bias cut binding would work well with this print. You can find all the other prints and a variety of colour ways in each here and a roll-up with 40 x 2.5" strips here. 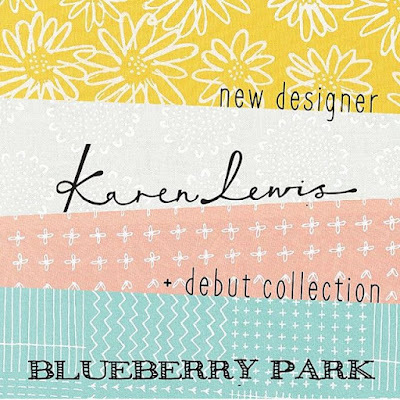 I saved the best till last, Karen Lewis' debut collection for Robert Kaufman, 'Blueberry Park' is available for pre order, dispatch estimated November. Eternal Maker did have a small quantity of Karen's prints for Festival of Quilts and they sold very quickly. I can't wait to have some of these in person! 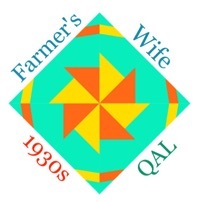 If you find an errors in the Farmer's Wife 1930s book either in the book text or on the CD check whether it is listed below and if not, please leave a comment on this post and I will pass the info on to the author. She also has a list of known errata here. Always check the seam allowances around each piece and/or section. They do vary at times, maybe due to printing discrepancies on PDF files, but they should all be ¼". Laurie Aaron Hird informed me that piece 15a is too small. She apologies profusely and suggests printing out a block diagram of block 15, Blossom from the CD and use this to make the template. You will need to seam allowance to this if that's your preference. Block 3 Alice: Some of the templates do not have true right angles where they should e.g. 3A, 3C, 3G, 3H. 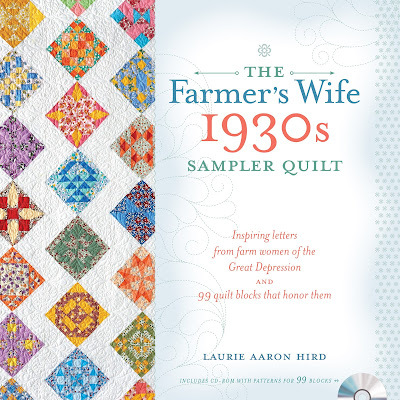 Laurie Aaron Hird is currently working on the corrections with the publisher although do note that the foundation paper piecing pattern works fine. Find temporary correction templates here. Download and print from your computer, if you print straight from Googledrive, you may find the print is not the correct size. Wynn of Zakka Art found just this! 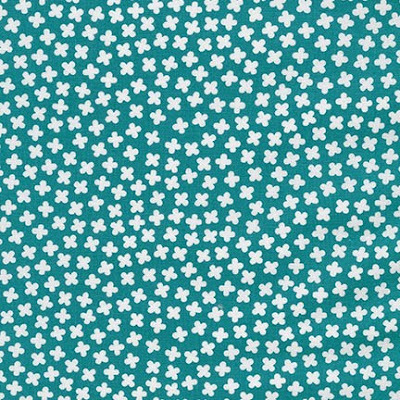 Block 15 Blossom: publishers are sorting out a download for this which should be available from October 2nd- Laurie will post download here. Block 26 Daffodil: the labels on N and I are reversed. This only affects the templates, the diagram is correct. Block 64 Monette publishers are sorting out a download for this which should be available from October 2nd- Laurie will post download here or email her through her website. Block 66 Mrs Anderson: publishers are sorting out a download for this which should be available from October 2nd- Laurie will post download here or email her through her website. I redrew the lines that were affected. See this post. Block 2 Aimee: Check the labelling- I've seen one copy of a pattern where the labelling for B was repeated on two sections instead of being labelled C.
Block 3 Alice: J2 should be labelled J3 and vice versa; K2 should be labelled K3 and vice versa. Block 64 Monette: Check that the seam allowances are a quarter inch. I found some came out rather scant- not sure if this is a discrepancy when I print or something that happens to others too. The sections were top of E, top of H, top of J,top of K.
Block 19 Carolina: 19A should be 19C. To make the Queen-size quilt you will need 99 blocks not 94. The fabric requirements for the setting fabric seem very generous and book reviews report being able to use a lot less. 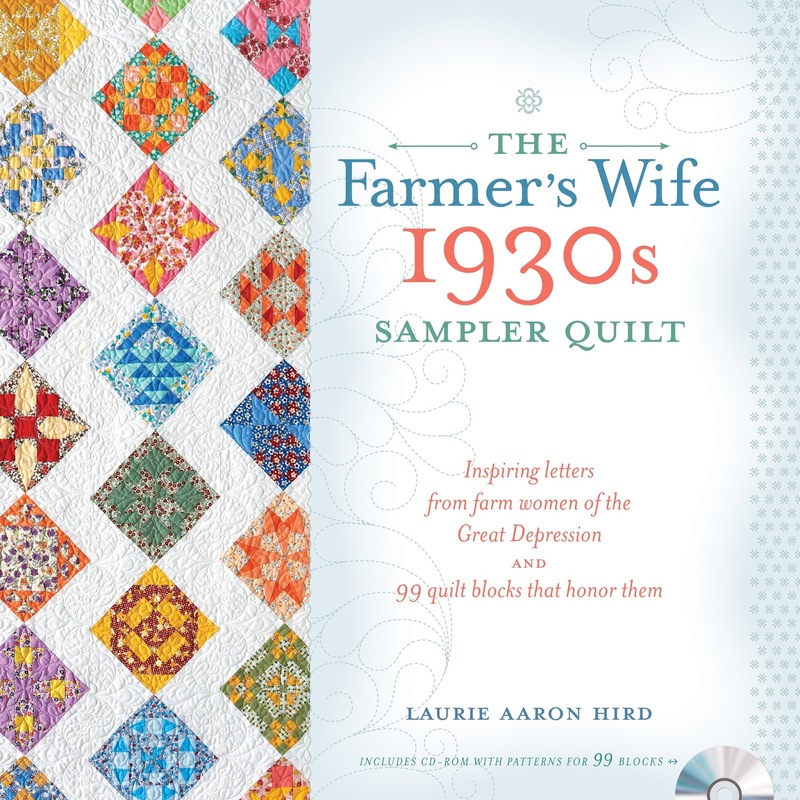 The blocks from this book are a different selection from the 1920s Farmer's Wife book with the brown cover. You could mix the two together but this quilt is for this book. 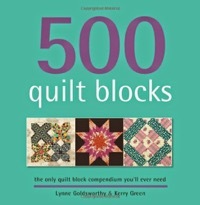 Some of the blocks are hard: have a flick through the book to prepare yourself! It is a great way to build skills but it would be a mighty challenge for a beginner. Guest bloggers have chosen their blocks and we will be working through the book in alphabetical and numerical order which will give a total mix of skills and challenge levels. Here are the lovely guest bloggers, many of whom I have known for years, with their blogs and Instagram account links, I feel very lucky to have them all contributing. share tips e.g. 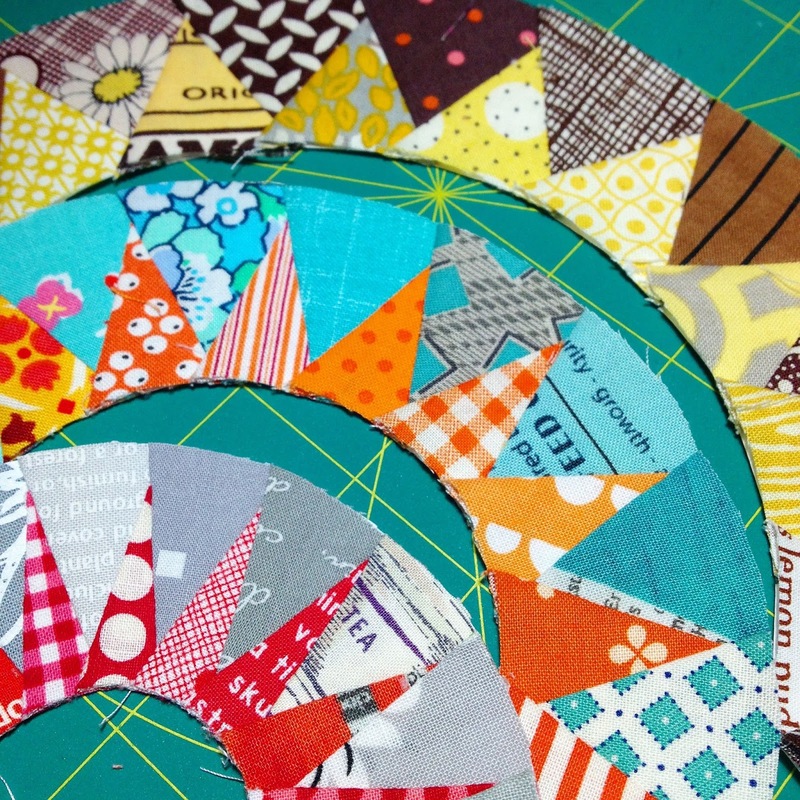 how big to cut some of your fabric pieces for foundation paper piecing. share techniques e.g. 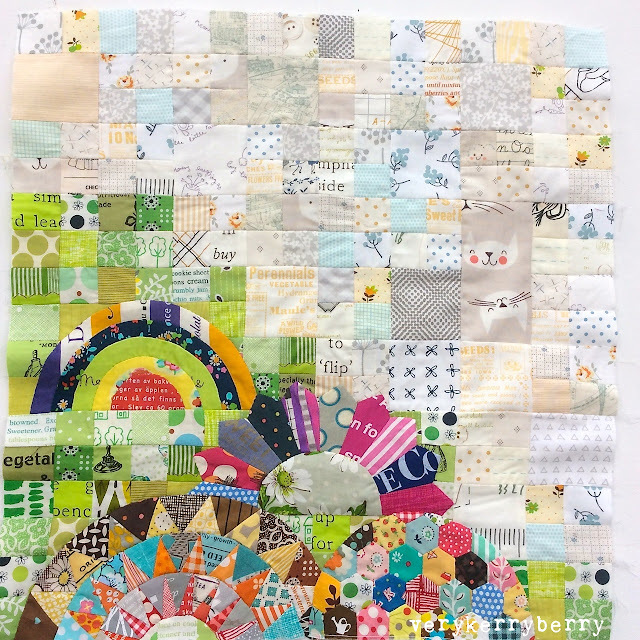 the guest bloggers include expert quilters, hand piecers, English paper piecers and foundation piecing wizards! 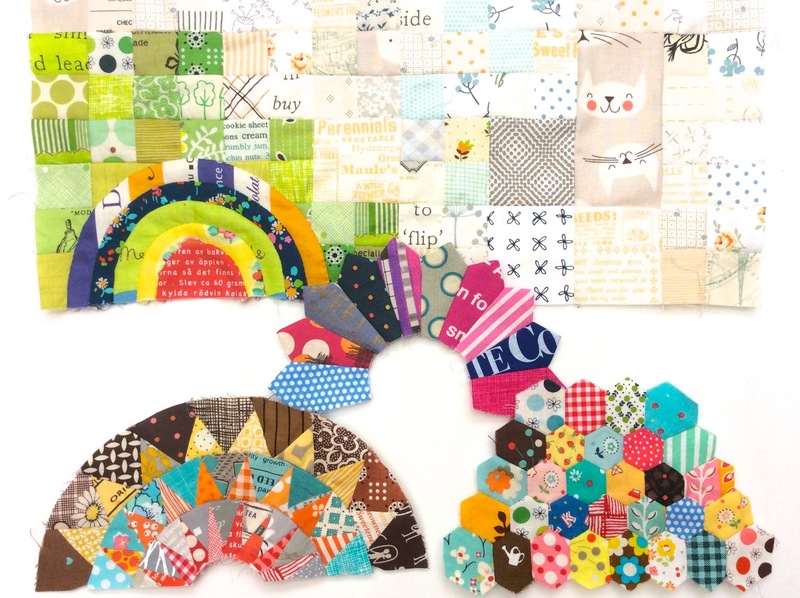 share ideas e.g.simplifying a block by reducing the number of pieces. share fabric and colour ideas. share thoughts on the book and the letters. note any errors and welcome you to do the same. There will be an errata page here so if spot a mistake, please leave a comment there to flag it up. Laurie Aaron Hird has already been in touch to tell me about one error and I've spotted the odd mislabelling. respect the author and the book copyright. cover every construction method each week which means that we won't pick up every pitfall, errata etc. The book offers three main methods of piecing: templates, foundation piecing and some rotary cutting. The rotary cutting is few and far between so don't rely on that as a sole method. I intend to foundation paper piece all the blocks so my tips will relate to that. 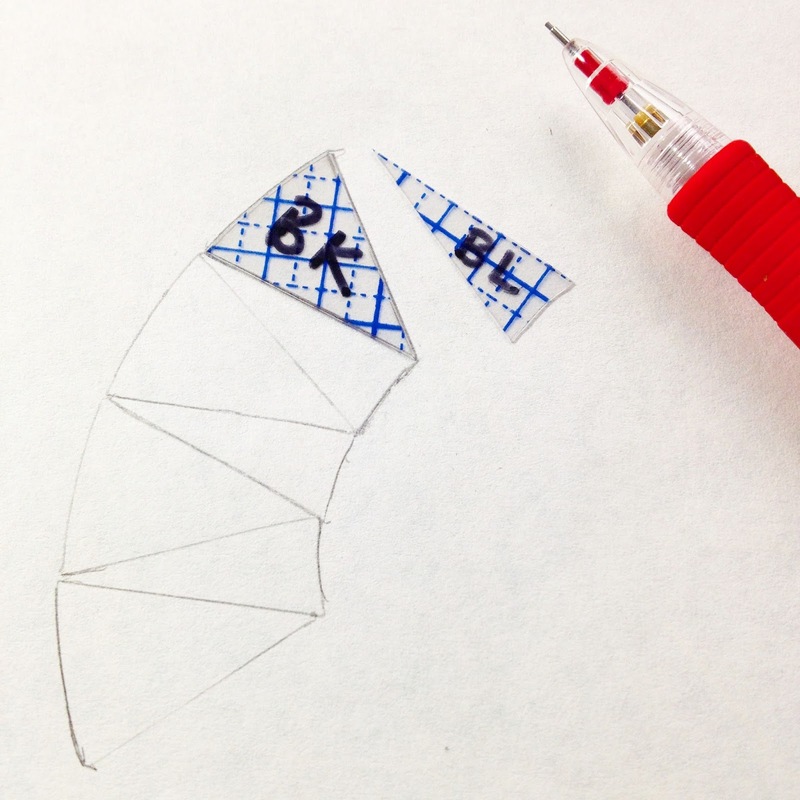 Break copyright and give measurements of particular pieces, e.g. for rotary cutting, even when those instructions have not been given in the book. I can give cutting details for foundation paper piecing as these are approximations. be teaching the basics of how to foundation paper piece each block. If you want to use this technique and have no experience of it, many of these blocks are very challenging so start with something easier! Find many tutorial links here. The same applies to the other construction methods. Tips and tricks yes but step-by-step descriptions for each block could start to threaten author copyright. 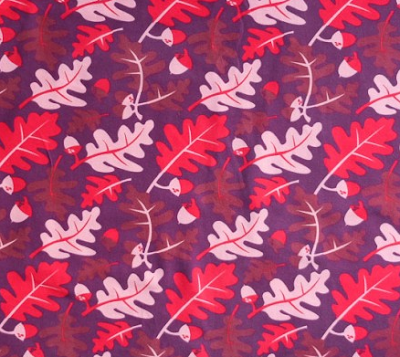 Wednesday 2nd September: Fabrics: colours, ideas and shops plus and extra guest post from Melinda of Quirky Granola Girl. 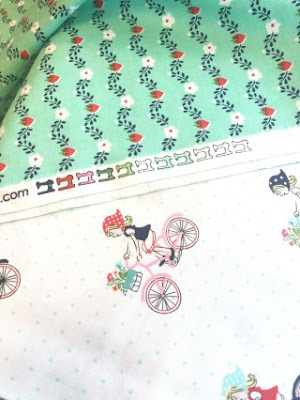 This is an unsponsored quilt along so the shops and recommendations are just personal recommendations and the emphasis is on using fabrics of your choice - you don't have to use 1930s prints- and keeping your equipment simple. All go with the blocks from Monday 14th September. Each Monday I will write a blog post about one block and link to the guest blogger who will write about the other block. I will use inlinkz at the end of a post so there will be an option for you to add a text link to your block. I am also going to try a little vlogging to introduce the week's blocks with Periscope. I plan to do this on Monday afternoon, around 2.30pm GMT each week. Persicope broadcasts are only available for 24 hours after going live. Read more about Periscope here and here. I am @verykb on Periscope. If you follow my twitter feed of the same name you will see when a Periscope is going live or download the Periscope app for free and follow me there! 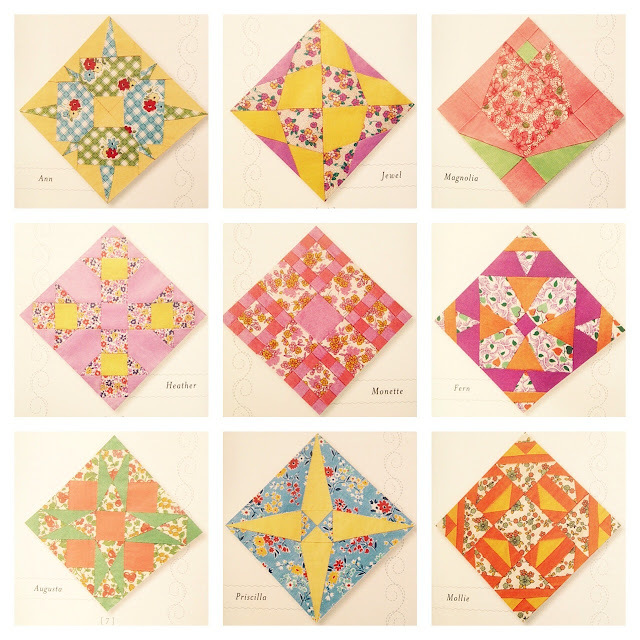 If you are new to quilt-alongs, the level of participation is up to you. 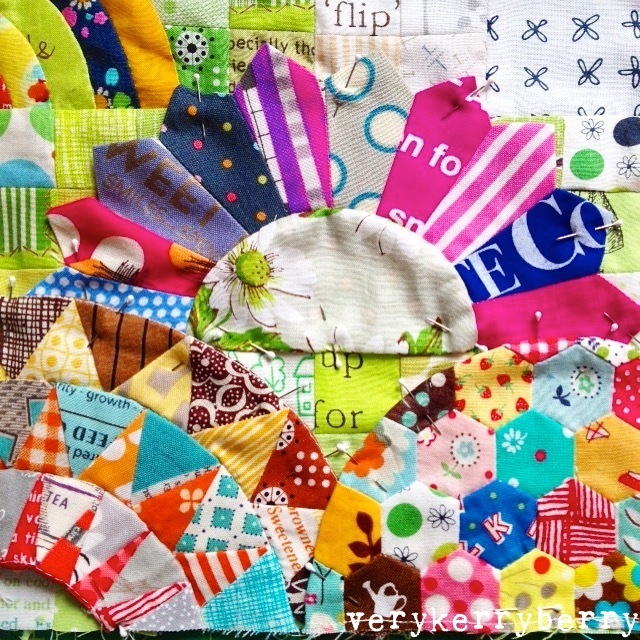 Quilt-alongs are all about providing encouragement to all those taking part and spur each other on. It gives us a sense of community to a pursuit that most of us do alone. 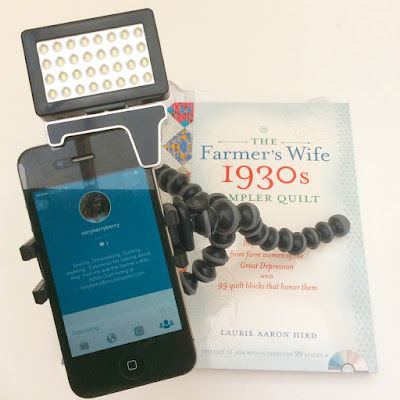 Sharing your progress is a popular part of a quilt along so this could be on Instagram with the hashtag #fw1930sqal, in the Flickr group or on your own blog. Find the blog buttons here. 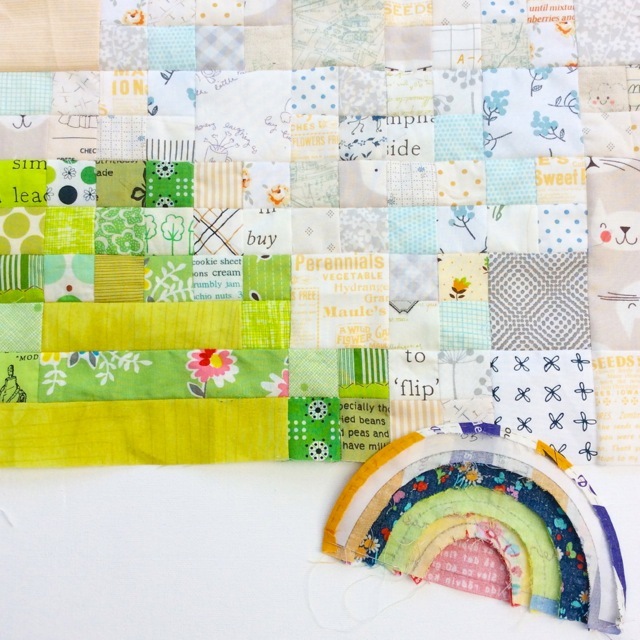 You might make all the blocks, or maybe just a few but we'll be here every Monday until next September with our thoughts on the two blocks from the book! A few weeks ago Girl Charlee Fabrics UK & Europe sent me an email offering me some fabric to try from their recently launched store. 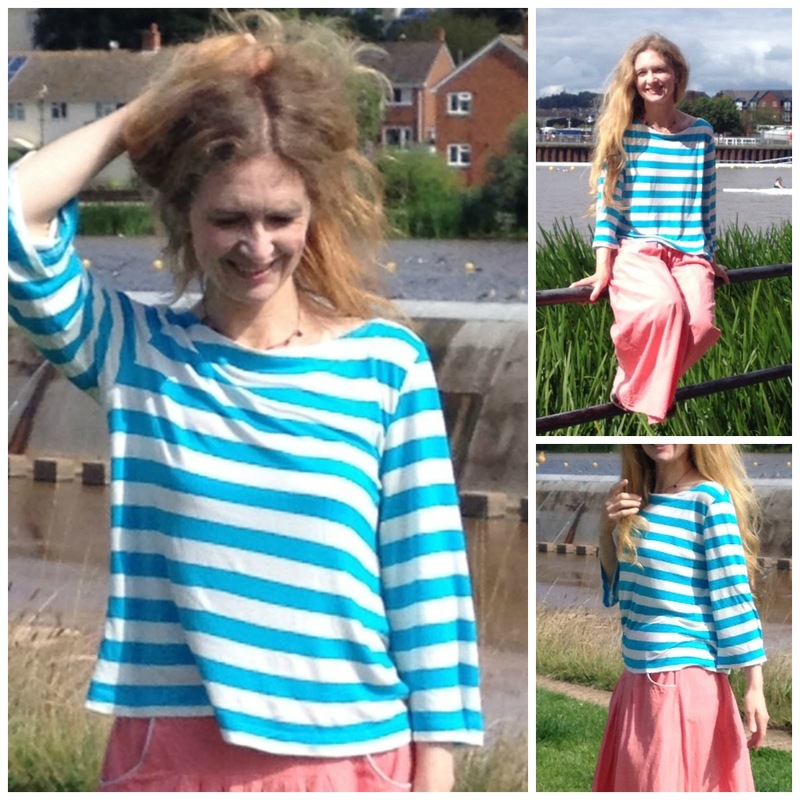 I chose a Azure/cream stripe with half a mind on an Agnes Top - I must have been swayed by the pattern cover picture! The fabric is a good quality lightweight cotton/rayon blend so very drapey and more suited to a looser style so I revisited "She Wears the Pants' and made another version of the cover picture top. The fabric is a little tricky to handle because of the rayon and stripe matching but ballpoint pins are perfect on fabrics like this. I needed to be very careful not to stretch it out of shape and even then, the cuffs especially looked a little wavy. Washing and pressing seemed to even this out and the resulting top has a fluid feel and is an easy wear on these inbeween grey days that we get so many of in the UK. These are iPhone pics during a family walk on a breezy day so you get the feel of the fabric movement. 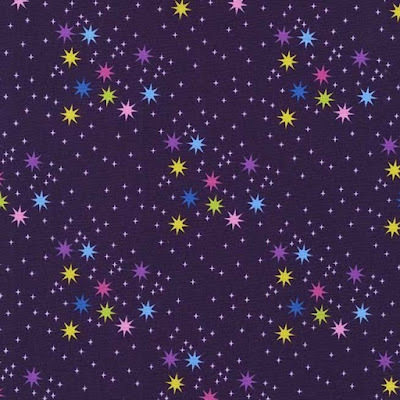 Like their USA counterpart, Girl Charlee have a huge number of knit fabrics to choose from and its a family run business with the emphasis on choice and customer service including a rewards scheme. Go take a browse at what they offer! Welcome to the second part of #mysmallworldqal part five. You can find part one here. 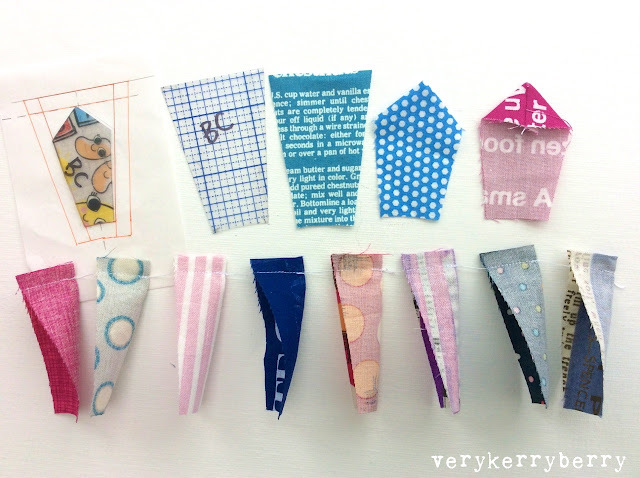 Danielle has been leading the way on this section and has two great posts featuring lots of hand piecing techniques - part one here, part two here. For those of you who are machining most of your My Small World quilt, I've some tips based on my experience of piecing it. Starting with the dresden. I wanted to machine piece this together and to use a machine based quick technique for turning the points on each fan blade. For this, I took the original template piece (far left in the pic below) and drew round it on paper. I added a horizontal line across the top of the piece and a ¼" seam allowance all round the new shape- these lines are shown in orange. 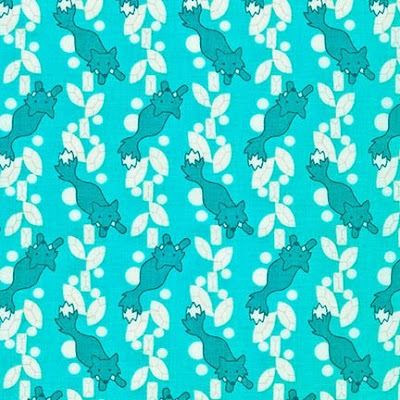 I then traced this onto template plastic so my new template included the ¼" seam allowance. Then, cut out your fabric pieces without adding any more seam allowance. When the top horizontal edge of the blade is folded in half with right sides together and sewn along (like the chain pieced examples at the bottom of the picture, it opens out to form a point the same as produced by the original template but a lot faster! I then sewed my fan pieces together at the sides and all the pointy raw edges are already neatly turned under! I pieced my centre semi circle into place as the pattern recommends but you could also appliqué it on top. For the piecing of the triangle arc and hexagons see here. Before I trimmed the hexagons to fit the BF semi-circle I sewed around the edges using a short stitch length about ⅛" away from the freezer paper pattern piece. This was to hold the edges together as the hexagons were hand stitched. To turn the raw edges on both arcs including the mini inner arc, I sewed a generous ¼" away from the raw edge using a 3.5mm stitch length. This makes a memory line in the fabric which makes it easier to turn with an iron. I also painted a little starch on to the edges. Once the arcs are pinned in place and appliquéd on, the stitches can be carefully removed. This technique is used a lot in dressmaking, especially for hems and I find it really useful in quilting too! I used appliqué pins to hold everything in place and I did tweak my placing quite a lot. I cut away excess fabric at the back so the layers aren't too thick. It didn't quite fit exactly as the picture despite everything being to size and my finished section is a little out of shape but once it is part of the quilt and also quilted, it will all be fine! You know I am a sucker for a chambray and Kellie-Rose always has a great selection. 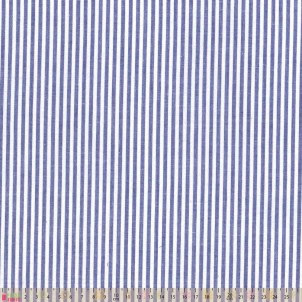 This is a shirt weight narrow woven stripe, 150cm wide, perfect for a shirt or maybe a shirt dress with lining. 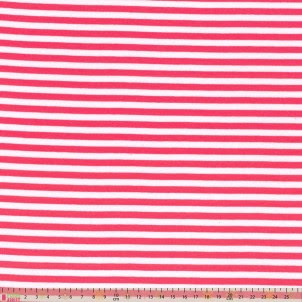 I must have a thing for stripes at the moment as my next choice is another stripe, Pink Candy Stripe, on a stretch viscose (3% lycra). This will be drapey and slinky to wear. It is a whopping 180cm wide so great value and the drape would make it great for a drop shoulder or dolman sleeve jersey top as it will hang nicely. 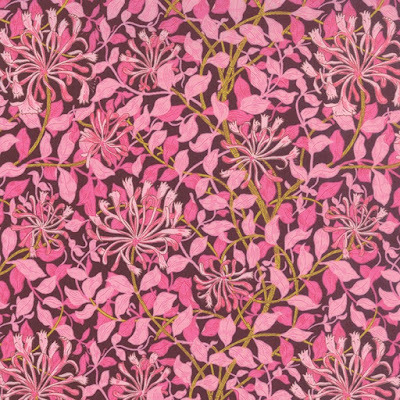 For heavier garment, maybe a jacket or even accessories like bags, this floral canvas is a pretty colour mix and the print reminds me of the Liberty Betsy print. It's another wide fabric at 150cm wide so you get a lot of fabric per metre. Go to the dressmaking section to get your 15% discount. 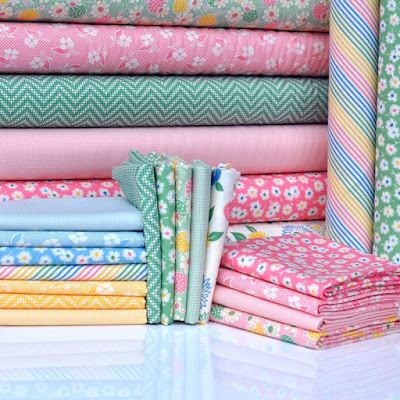 There's been a lot of new arrivals in the quilting fabrics. 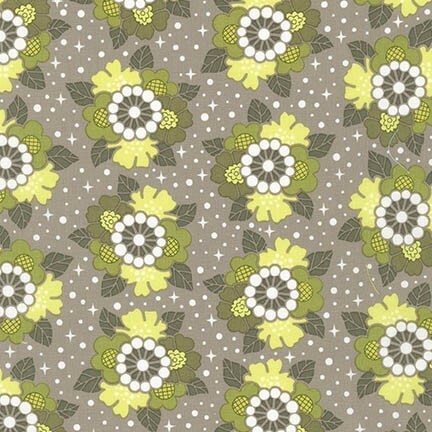 I always enjoy seeing Tacha Noel's fabric collections for Riley Blake. 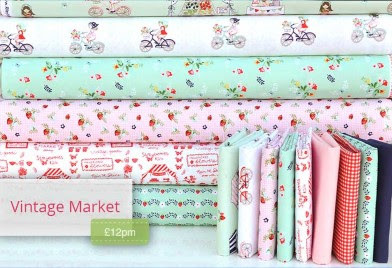 Her latest is Vintage Market which is a pretty mix of florals, illustrated scenes and text prints. The prints above are Vintage Market Vine in Mint and Vintage Market Bike Ride, also in Mint. The new Birds and the Bees collection from Tamara Kate for Michael Miller is a vibrant mix of birds, bees, butterflies and ladybirds inspired by her mother's ceramic bird collection. I picked a favourite collection from a repro designer. 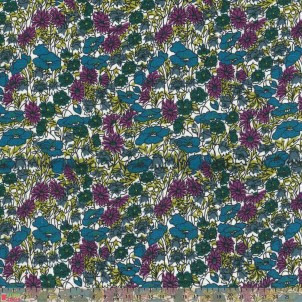 If you like deep, rich colours, you may be drawn to the new William Morris reproductions, 'The Morris Jewels' by Barbara Brackman for Moda. 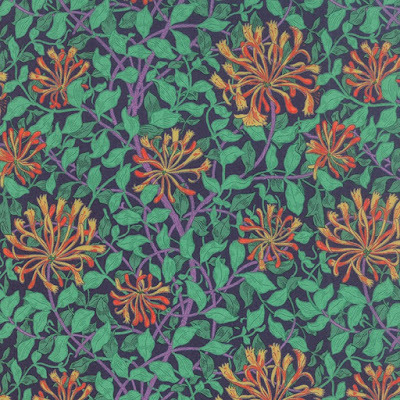 These are incredible colours and I have always had a soft spot for William Morris prints from the days when my mother used to make covers for our sofa from Day Lily and other Morris designs. 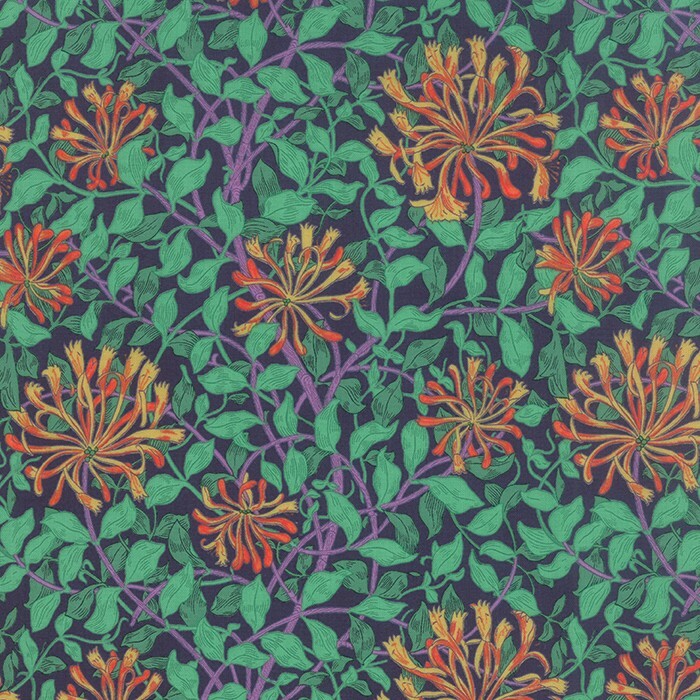 This is Honeysuckle in Jade. 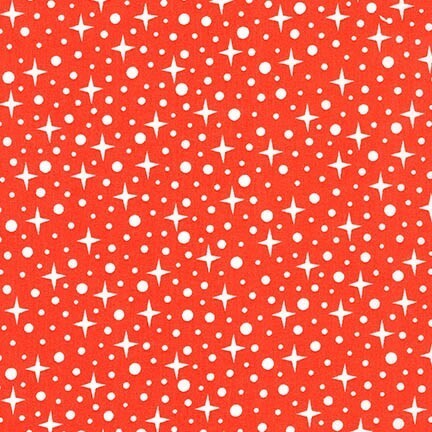 And this is the same print in Ruby, Wow! I've been doing some prep for the Farmer's Wife 1930s Quilt-Along so I'll leave you with a 30s inspired Moda selection, 'Fresh Air'. 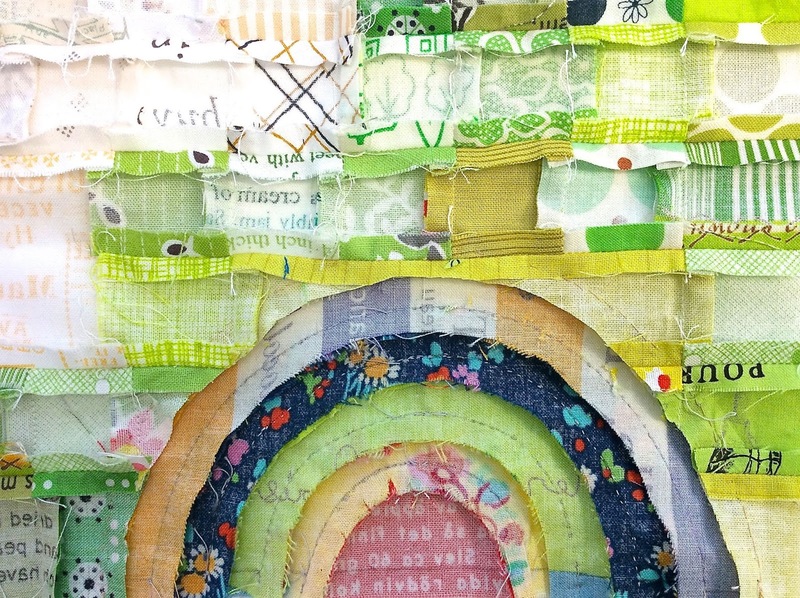 Part 5 of My Small World Quilt-Along is a detailed and time consuming section and the very talented Danielle of Mes Petit Elefants will be talking you through all the techniques and skills she has employed to fit this section together! She is an experienced hand piecer and this section has a lot of piecing that you may find easier to do by hand. I've tried to spread the hand sewing out over the last few weeks so I'm not doing it all in one go. For the hexagon semi circle, I didn't English Paper Piece as I find it rather fiddly and hard on the fingers. Instead I hand-pieced sewing along the seam lines only. 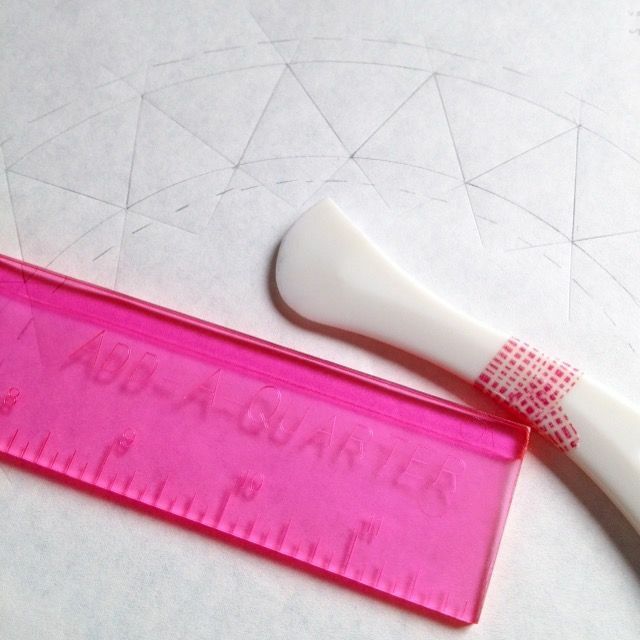 Draw round the hexagon template in soft pencil. Cut out with ¼" seam allowance. Arrange layout in rows. To join the rows of hexagons, place two right sides together. Using a knotted thread, sew small running stitches along the pencil line. At the end of the line, secure the seam by looping through the final stitch. I usually sew another stitch on top of this and loop again to make sure. Repeat until all rows of hexagons are sewn. I don't press at this point but all the seam allowances are floating so they can flatten in any direction. 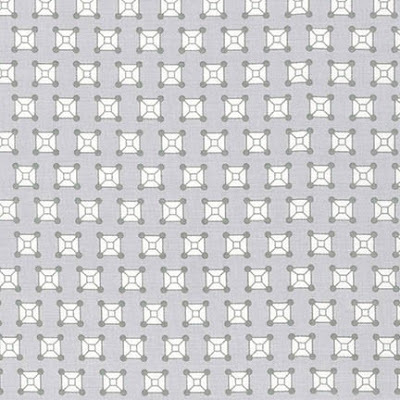 To join the rows together, start at the end of a row, place a pin perpendicular where the first joining seam will finish. Sew seam as before, secure at the end but do not cut thread. Instead, pivot the fabrics to join on to a new hexagon and sew the next seam as before. Continue until all the rows are joined. Press seams as desired, I pressed to one side. 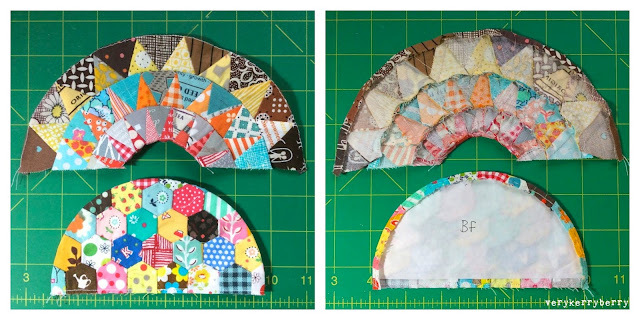 For the arcs, I followed the same technique as Danielle with freezer paper piecing: she describes the process here. I reused the outer arc template to turn the raw edge inwards for appliqué with a mix of starch painted on and running stitch- I did the same thing with the circles in part 2, method described here. This is this area from the back with the green fabrics behind the appliqué cut away. You can just see the little snips I made in the concave part of the arches as the convex curves were added, especially in the lemon yellow fabric. For the triangle 'New York Beauty' style arcs, I drew round the plastic templates on very thin paper to create a foundation paper piecing pattern. I used a fine pencil and overlapped the templates slightly over the previous pencil line to keep it accurate. I added 1/4" seam allowance all round and pre-creased the seam lines with a Hera marker. I find this makes it easier to flip the paper back and forth whilst piecing. I found multiple colours a little overwhelming for these sections so I plumped for some favourite contrasting colour pairings for each arc. These were sewn on the machine but I hand pieced the arcs together, Danielle shows how here. As there is rather a lot to fit into one blog post and I have still got to appliqué all my sections down, I will add a second part to this later this week and Danielle is doing the same. 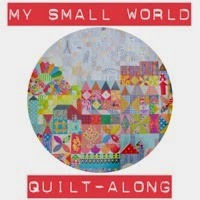 As ever, if you are on Instagram, check out the #mysmallworldqal hashtag. I read some great tips on there including using English paper piecing coupled with a little glue basting as a way of sewing both the curved arcs and the triangle arcs- thanks @elletaylor7 for that tip! See you later in the week, I hope your Small World is progressing well, my thoughts are already turning to quilting, now that's a conundrum, I have no idea!